There is no sign of a resolution as hundreds of thousands of federal workers continue to go without pay. 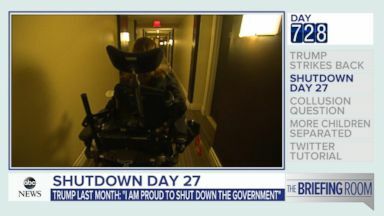 out of Washington, it is day 29 of the partial government shutdown with no deal in sight. And president trump is promising a major announcement this afternoon. ABC's Stephanie Ramos is at the white house with the latest. Stephanie, good morning. Reporter: Dan and whit, good morning. No details yet as to what exactly the president will say later this afternoon from the diplomatic room here at the white house, but we do know the president has not budged on his demand for $5.7 billion for the border wall, and Democrats right now say they're going to refuse to negotiate until the government re-opens. Today, president trump is set to deliver what he calls a major announcement from the white house on the government shutdown and southern border. I'm not going to get ahead of the president, but I can assure you that he's going to continue fighting for border security. Reporter: The standstill over the border wall now in its 29th day. The president even threatening weeks ago to sign the national emergency declaration in order to bypass congressional approval for funding of the wall. We can do it. I haven't done it. I may do it. I may do it, but we can call a national emergency and build it very quickly. Reporter: His announcement comes as 800,000 federal workers remain furloughed or working without pay. End the shutdown now. 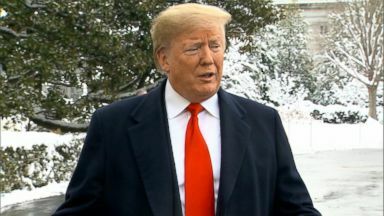 Reporter: Capping a week of political back and forth starting when house speaker Nancy Pelosi asked the president to postpone his state of the union address because of the shutdown. Does this week put us further apart in terms of trying to settle the shutdown? Hopefully not. Open up government is the solution. 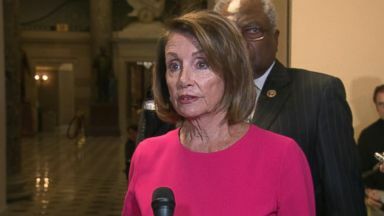 Reporter: Pelosi canceling her plans to visit troops in Afghanistan saying president trump caused a security risk by publicly announcing her trip when he denied her the use of a military plane. Do you view this as retaliation for your letter about the state of the union. I would hope not. I don't think the president would be that petty. Reporter: The president tweeting this video Friday. Take the politics out of it. Let's get to work. Reporter: But he also repeated these warnings. We have to secure our southern border. If we don't do that, we're a very, very sad and foolish lot. Reporter: Exclusive video showing Monday this large group of asylum seeking families making their way into the U.S. Through tunnels. Border agents currently working without pay meeting them on the other side. On this 29th day of the shutdown there is still no resolution as hundreds of thousands of federal workers go without pay struggling to make ends meet. There is a lot of pain out there and we should not overlook it. Stephanie, thank you so much. There's a lot to talk about this morning, so let's bring in our chief political analyst Matthew dowd piping in to ys from Texas. Matthew, good morning. So the last time the president addressed the nation about this shutdown, it did not move the needle either in terms of public opinion or in terms of ending the shutdown. So do you think whatever he has to say today is likely to be different? Well, Dan, I think it's, one, it's a little bit bizarre to make an announcement saying you're negotiating. You don't include anybody from the opposite side, any Democrats on this and then the people that you say that you met with that your announcement comes from are only from the Republican side of this, only from Mitch Mcconnell. So that is one, it's rather bizarre but, two, I don't think the president is going to have any effect on the nation and for two first, a majority of the country disapproves of this president. His job approval now has fallen to 37% or 38% and, two, two-thirds of the country doesn't trust this president so when a president stands up with those kind of ratings and talks to the American public, it's very hard for me to believe he's going to be able to move anybody when a majority is already resoundingly against him. Let's talk about the other big story this morning, that buzzfeed report. Overnight as we saw that extremely rare statement from the office of special counsel. Let me just read it again because I want to get into it a little bit. Buzzfeed's description of specific statements to the special counsel's office and characterization of documents and testimony obtained by this office regarding Michael Cohen's congressional testimony are not accurate. That doesn't seem like a blanket denial. They're not coming out and saying this story is full on false, so what do you make of what they're saying? Well, I think the special counsel wants to make sure that, one, that they -- they're demonstrating they weren't the ones that leaked anything. Two is you're exactly right. They didn't say anything that buzz feed reported was false or untrue, they basically said there were elms of the story that weren't accurate, so it's not as you say a blanket denial in this. I think Bob Mueller wants to protect his own integrity and the process' integrity when we finally have a report on this. I think so many people are so anxious for that report and temperatures unlike the weather that we're seeing coming in this weekend are very hot around this, so anything around this becomes overheated in the process. So I think it's best if everybody just pauses and calms down before we launch into these things. And, again, what buzzfeed was reporting is that the president allegedly told his former lawyer, Michael Cohen, to lie to congress. The fact that here we are 36 hours after this report first surfaced and no other journalistic organization has been able to confirm those allegations, what does that say to you? Well, I think we're in a time where our politics and our journalism, we ought to do it methodically and we ought to do it in a process that doesn't get out in front of what's going on. Again, everybody is so anxious and on pins and needles about the report and it's been now obviously the investigation has been going on almost two years, I think it's best everybody do this in a calm and reasoned manner and I think that applies not only to our politicians but journalists as well. Absolutely, Matthew dowd, really appreciate your analysis on a Saturday morning. Have a great rest of your weekend. 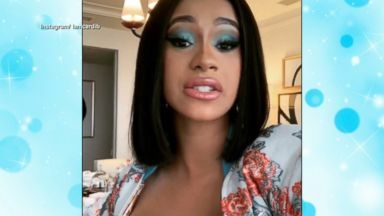 Count rapper Cardi B as one of the millions of Americans who thinks something needs to be done about the ongoing government shutdown. The president cited the government shutdown as a reason to cut off Nancy Pelosi's access to military aircraft and called the trip a "public relations event."